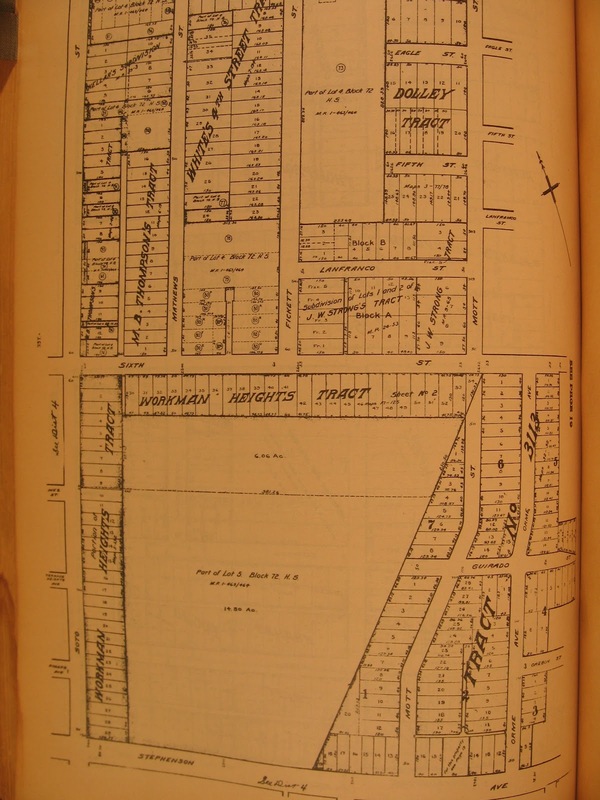 Boyle Heights History Blog: The Boyle Heights and Hollenbeck Heights Controversy! The Boyle Heights and Hollenbeck Heights Controversy! A recent question about when the name "Hollenbeck" was applied to the Los Angeles Police Department station in Boyle Heights led to an interesting aspect of the history of the neighborhood. First, a police station was contemplated for the community as far back as the mid-1890s, though it was a few years before one was opened. It appears that it was called the "Boyle Heights Station" well into the 1920s. The name "Hollenbeck," which was the name of an early investor and resident, John E. Hollenbeck, came in as part of a larger, controversial proposal: changing the name of the community. This idea of changing the name of Boyle Heights is not limited to the 1920s. For example, there have been calls to rename the neighborhood because of the name "Boyle," which reminds people of "boils"! Others have argued that namesake Andrew Boyle lived so long ago (he died in 1871) that no one knows who he is and, that being the case, why not come up with a name of someone more familiar to modern Angelenos. Whatever the merits of those and other arguments are, there was a serious movement to rename the community by 1922. Late that year, an article appeared in the Los Angeles Times provocatively headlined "Boyle Heights in Arms" with the subheading of "Proposal to Change Name of Historic Section Rouses Protest From District's Citizens." The article was put out in advance of a meeting to be held at the Boyle Heights Public Library the following evening under the auspices of the Boyle Heights Improvement Association (which likely had a strong interest in promoting business and commerce in the neighborhood), a committee of which, consisting of W. J. Miller, Dr. D. D. Edwards, and D. S. Valentine, considered alternative names, including "Roosevelt Heights," presumably in honor of the late president Theodore Roosevelt, who had died in 1919, and "Hollenbeck Heights," and perhaps others. When the committee went public at a recent Improvement Association meeting with their suggestion of "Hollenbeck Heights," this was reported in the Times with caveat that "it is possible another name will be chosen in case the association with the approval of the citizens decides to take steps to have the name changed." 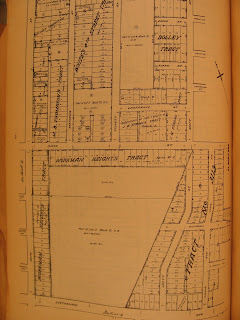 This is a page from a Baist's Real Estate Atlas dating to about the 1910s and shows a section of Boyle Heights a few years before a controversy erupted concerning a name change proposed by the Boyle Heights Improvement Association. The area covered is roughly from 4th Street on the north to Whittier Boulevard (then called Stephenson) on the south and from Soto Street west to about Camulos on the east. Click on the image to see it in an enlarged view in a separate window. Courtesy of the Workman and Temple Family Homestead Museum, City of Industry. Curiously, the article ended with the statement that "in spite of the service rendered Boyle Heights and Los Angeles in general by the Boyles and Workmans . . . it is proposed to change the name to one 'more in keeping' with the progress of that section." Why the name "Hollenbeck Heights" was more symbolic of so-called "progress" than that of "Boyle Heights" went unexplained. In any case, the piece concluded by observing that "a hot debate is promised for tomorrow." On 14 November 1922, the Times duly followed up on the meeting with a piece titled "Eclipse on Boyle Heights" and a subhead of "Hollenbeck, as New Name for District, Obliterates Old Appellation by Turbulent 150-1 Vote." Actually, the vote was not at all turbulent, as indicated by the overwhelming consensus in the final tally, the only naysayer being the widow of attorney Robert H. F. Variel, a prominent Boyle Heights resident. There were, however, several impassioned speeches in defense of the name "Boyle Heights," including Andrew Boyle's grandson and namesake, Boyle Workman (a Los Angeles city councilman through most of the 1920s), Henry C. Lichtenberger of the city's Planning Commission, and Frank Dominguez of the noted Californio family who owned much of the South Bay area. While Lichtenberger and Mrs. Variel were described as "making passionate pleas for the memory of Andrew Boyle, pioneer, and W. H. Workman, who originally owned all that land . . .," it appeared that Dominguez applied every rhetorical device known to humanking in his remarks. The article was sure to note that "Mr. Dominguez waxed so eloquently that his rhetoric encompassed the towering mountains reaching unto imperial heaven, the shimmering ocean lapping against our fair shores, the chivalry and righteousness of our forefathers, the blood of our dead in France [during the late World War], and the glorious principles of civilization." Alas, all the flowery and impassioned language was to no avail. Speaking of language, the motion put forward to change the name (though the copy of the article found online was remarkably faint and hard to read) includes some laughable language. For example, the motion stipulated that "whereas the name of Boyle occasioned ridicule and stimulated ribald thoughts in the impressionable mind . . . [and] it aroused thoughts of pimples" the name should be changed to something "more dignified" such as Hollenbeck Heights. This was deemed necessary because the "ribald" name of Boyle "thereby proved to be a serious hardship to the development of the" community. Notably, Dr. Edwards, one of the committee members promoting the name change, asked the assemblage whether any of the descendants of Andrew Boyle or William H. Workman live in Boyle Heights, which provoked, reported the paper, a "loud and naughty laughter." Indeed, the Boyle/Workman descendants had only recently uprooted from their namesake community and transplanted themselves to the emerging desirable residential enclaves to the west of downtown, as many people had been doing as the "Westside" developed. Edwards then mocked those who came in from other districts of the city to defend the early founders of Boyle Heights and suggested that a properly-inscribed monument be erected to them "and then change the name of Boyle." Other comments and repartee were issued and recorded before the overwhelming standing vote was taken and Mrs. Variel was left alone to defend history and precedence, leaving the paper to remark that "the intruders could not vote" and, while they were a "gentlemanly, rhetorical opposition," they proved only to be "ardent, but voteless." In coming years, there were occasional references to "Hollenbeck Heights," including an April 1924 Times article that addressed the fact that "the Hollenbeck Heights division" of the Los Angeles Police Department was "to be made the model police division of the city," according to Chief August Vollmer (a longtime chief in Berkeley, whose short stint in 1923-24 was terminated by his disgust at the corruption and hostility against the department from outsiders leading to his return to the Bay Area city he had left.) In fact, Vollmer specifically referenced the systems he used in his previous job as to be implemented first at Hollenbeck Heights before being used elsewhere. His resignation soon after, however, ended those plans. In September 1926, a fascinating article that will be the subject of a later post on this blog was written by Isabel Lopez, descendant of the family that, in the Mexican era, settled what became Boyle Heights. The piece was called "Hollenbeck Heights Once Was Home of Pioneer Aristocrats" and mentions the fact that the Spanish-language name for the area, El Paredon Blanco, or White Bluff, was "now known as Hollenbeck Heights." The contents of the article awaits further discussion, but there were at least some people, including scions of the early Latino settlers of the area, who had accepted and used "Hollenbeck Heights" as the community's name. Yet, the original name of Boyle Heights soon was revived. When and how exactly that happened awaits further probing and poking . . . unless someone out there already knows and can leave a comment to this post about it. I have the original book i got from an auction with alot of clippings. Its The Story of Los Angeles by Boyal Workman The City That Grew. Its pretty interesting. Any thoughts of what I can do with it? Hello Cynthia, thanks for the comment. There were quite a few of the Boyle Workman books published in the 1930s and so it doesn't have a high collectible value, though the clippings might be interesting, depending on what they contain. Newspapers, however, are increasingly being scanned for online access, so their paper value is also lessening.